At Book Works, young people learn to write and illustrate books by writing and illustrating short books under the guidance and supervision of instructors. Their books are published in the Book Works literary journal, “BEEHIVE”. the patience and stamina to experiment, make mistakes, learn, and repeatedly revise a piece to make it better than it was. Student writers meet with instructors once a week for twelve weeks. If they don’t have an idea for a story when they come in, we have a variety of idea-generating games and activities that help ignite story formation. Once a writer has an idea, (s)he works with a designated instructor to turn it into a finished book. Instructors give feedback on clarity and make suggestions, but do not decide the content of the story. Instructors also help the writer devise a general plan for the production of the book. In classes 1-3, there will be games and exercises to build the skills of the students and generate ideas for their books if needed. 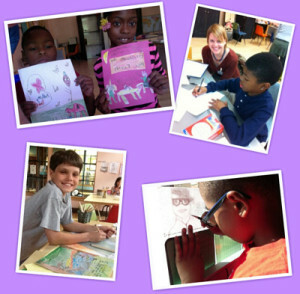 Classes 4-6 will be used entirely for working on the books that the kids will have started. Classes 7-9 are an exact repeat of 1-3, except that students who already did 1-3 can opt out of activities and focus on their books if they like. Class 7 is also the class where any drop-outs will be replaced by new students, so for them, it will be 1-3. Classes 10-12 mimic 4-6 in that it’s all individual work with instructors, but for those who are experiencing it as 10-12, the focus is on finishing the books. Day 1: After parents have filled out forms and the rules have been discussed, kids will play the board game, “Story Quest”. This game incorporates the concepts of character, setting, desire, and obstacle, via a game where students (in pairs) write a story in seven (or more) sentences. Day 2: Illustration techniques are demonstrated by an instructor, then practiced by students in a series of exercises. Day 3: Students try their hands (alone or in pairs) at fixing a given story that has fundamental and superficial flaws. Then, as a group, share the results and explore options through improvisation and discussion. At some point in the day, most likely the beginning, students will complete a handwriting/letter-formation exercise under the supervision of an instructor. Once the instructor and the publisher have decided a particular student is sufficiently skilled, that student can drop it from the day’s agenda. At the end of each class, instructors and writers collaborate on a brief report describing what the writer did that day and plans to do next time. The report goes in the student’s file and will be reviewed by the lead instructor and by the editor/publisher of “BEEHIVE”, who will leave feedback as needed. The lead instructor also observes the writers at work during class and can serve as a substitute instructor if necessary. If a child is toilet trained, able to form letters on paper, and converse with an instructor, the child can join the program and write a book. As with all BWorks programs, we don’t enroll anyone 18 or older. What if they don’t finish a book in 12 weeks? They can come back until they finish. Fiction is what we teach, and the form for which our idea-generating activities are suited, but if a writer comes in really on fire to write poetry or non-fiction, that can be accommodated.